Stitchin' Bints: First Tardis sock (almost) complete! 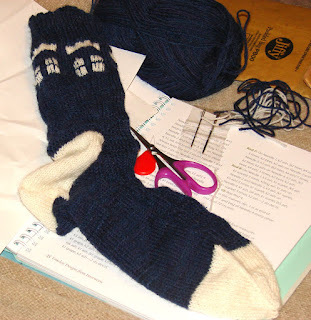 I don't remember being good at needlework at school, I don't think my gonk was very good, so I'm a little perturbed about having to embroider the 'Police Box' lettering. The detail on the windows has gone well though, and I'm very pleased with the knitting generally. 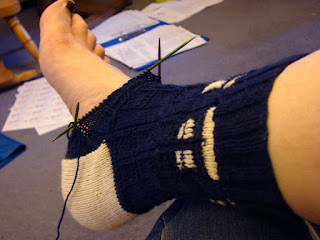 I really like the 'square panel' pattern (probably not easy to see in the photos) and so I carried it on over the top of the foot, knitting plain just on sole, toe and heel. Ahh! Gonks! Life was simple then. Nice socks. Yes I remember gonks. Were they a compulsory part of the syllabus?? Love the sock. LOL It might have been the syllabus. First project was a gonk, but the embroidery didn't happen until the second project - another little toy (a black cat in my case). I really didn't take to embroidery, and haven't managed to stick with things like quilting. Give me big needles rather than little ones!